enchanted bitcoins | "The first public bitcoin kiosk available in the United States, at Imbibe in Albuquerque, NM"
Come by and visit us: buy bitcoin for cash, almost instantly! 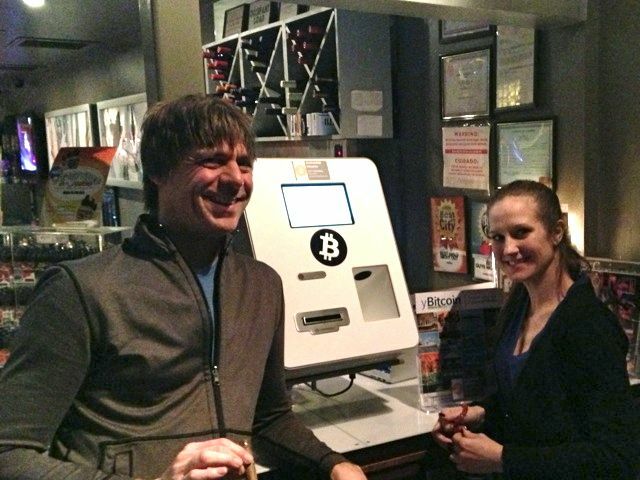 February 10, 2014: enchanted bitcoins’ Bitcoin kiosk, permanently installed and available to the public daily. Left: Eric Stromberg, founder of enchanted bitcoins. Right: Cathy Chenevey, bar manager at Imbibe. Please bring a printed QR code for your Bitcoin address or a smart phone able to display it for you. We can also provide a securely generated paper wallet for you, if you request one, for free. Naturally, only cash (USD bills) are accepted.